Showers and some thunderstorms will develop again Thursday afternoon ahead of a cold front that will usher in much colder air for the weekend. Thursday morning will start out quiet, but a front sagging south from Canada will trigger some showers this afternoon. Some of these showers could have heavy downpours, a little thunder and lightning, and maybe some small hail. Showers will mostly develop after 3 pm today and will continue into the overnight hours and Friday. Some snow may start to mix in overnight and during Friday morning as colder air moves in. 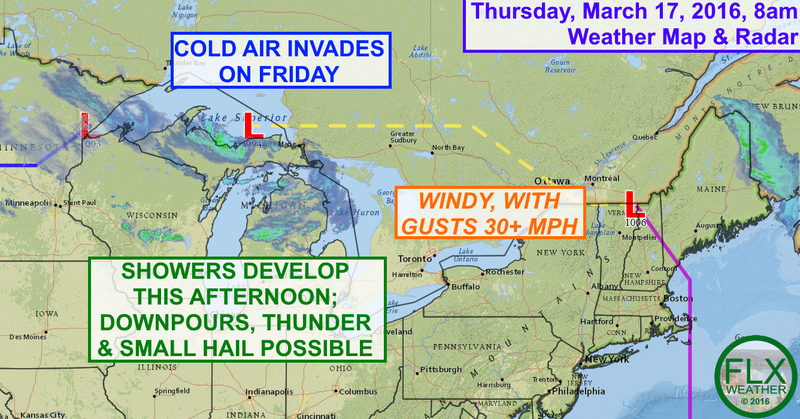 It will also be windy on Thursday, with gusts over 30 mph for much of the region and even stronger across the western half of the Finger Lakes. Highs Thursday will be in the mid 50s, but will only be near 40 degrees on Friday as cold air moves in. Precipitation should end in the late afternoon on Friday, with sunny skies developing for Saturday. Temperatures on Saturday will start in the low 20s and will rise to the low 30s. Sunday is a touch warmer, with highs in the upper 30s, but it will be cloudy. Some light snow is possible Sunday night, especially for the eastern Finger Lakes, but remains uncertain. The cold weather will stick around until the middle of next week.